Photo by Johan Persson . It’s easy to pour scorn over this new stage adaptation of Shakespeare In Love — it’s fruity, hammy and cheesy (like a snack at a childrens birthday party) — but it’s also a lot of fun. Unashamedly commercial, this is a clunking, middle-brow crowd-pleaser that nonetheless delivers comedy, tragedy, rich heritage visuals and, of course, a bit with a dog. If you’ve seen the film, you’ll know the plot and if you haven’t, the title says it all. 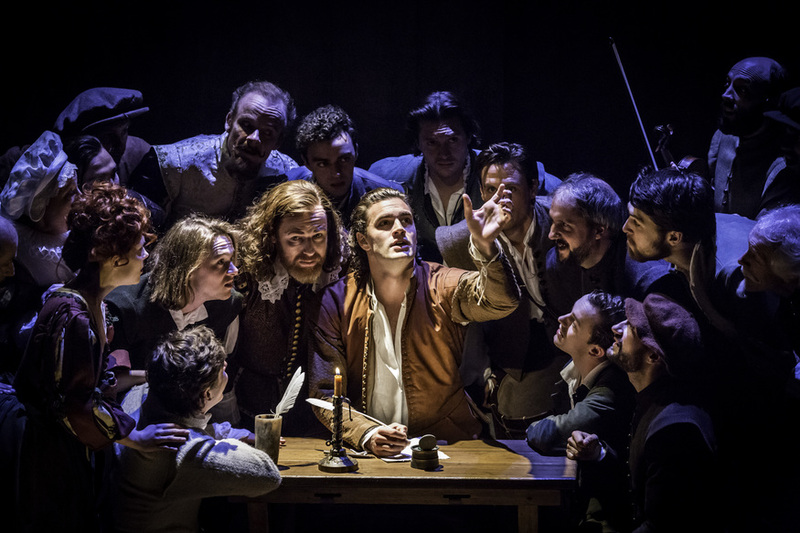 The story is all about young Will Shakespeare (Orlando Bloom lookalike Tom Bateman) curing his writer’s block by falling head over heels with Viola De Lesseps (Lucy Briggs-Owen) at the same time as the first ever performance of Romeo and Juliet takes shape around them. 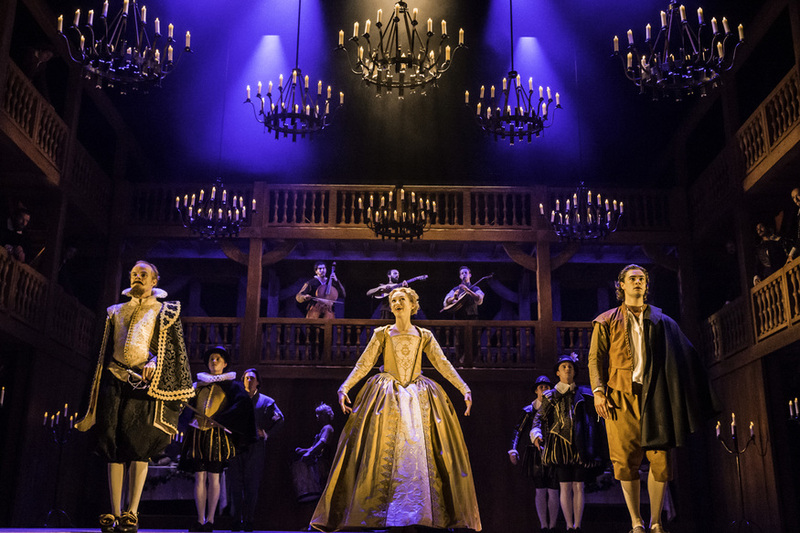 The leads start drippy and get ever wetter as they wade through the schmaltz, but the Elizabethan world that’s been created here is beautifully realised and the supporting players are all cracking good company. Real historical figures – such as actor Richard Burbage and playwright Christopher Marlowe are woven into a well thought-through social tapestry complete with cheeky prostitutes, rough brigands and Cockney watermen. The pacy choreography of scene changes helps create this sweeping illusion of Elizabethan society (though it helps when you have 30 odd bodies on stage). The major achievement here is by director Declan Donnellan (best known for his swirling shows with Cheek By Jowl) who hustles the story along within a clever and elegant set designed by Nick Ormerod (the ring of Tudor balconies seems to breathe in and out as they conjure up variously the Rose and Curtain Theatres, a country palace, a backstreet whorehouse and a ship sailing off for America). There isn’t too much that’s been changed from the film – though perhaps that’s what the fans want. And when you have slick, knowing one-liners by a writer like Tom Stoppard, there probably isn’t much need for adaptor Lee Hall to actually do anything. One smart retouch however is in the scene where Shakespeare woos Viola on her balcony (à la Romeo and Juliet). Now Kit Marlowe is on hand to help tongue-tied Will, mentoring him in the language of love like Cyrano de Bergerac. This scene is the highpoint of the show: both clever, very funny and all the more sweetly romantic for its light touch. It’s also a nice metaphor for the entire production – a few too many ideas-men designing by committee but somehow getting away with it and giving the audience exactly what it wants. To misquote Julius Epstein on Casablanca: “The script has more corn than the state of Virginia, but when corn works, there's nothing better." 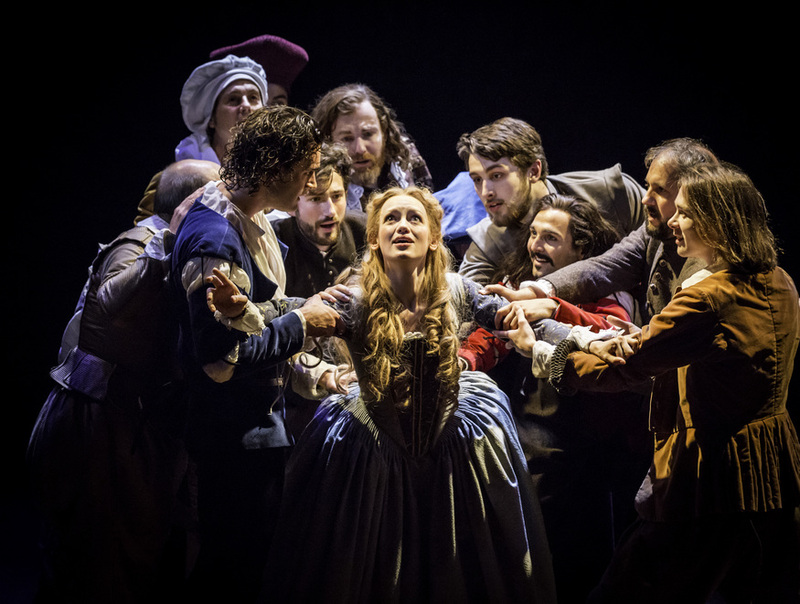 Shakespeare In Love is on at the Noel Coward Theatre until 25 October 2014 (although this one will likely run and run).